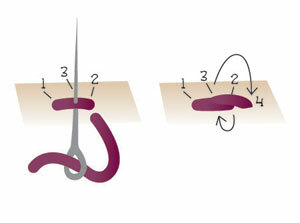 After you have a knot in the back side of your embroidery to keep your thread in place, come up and go back down the length of your desired stitch (1 to 2). When you come back up, come up about a stitch length away (3) from your first entry point (1), and then go back down right next to it (4). 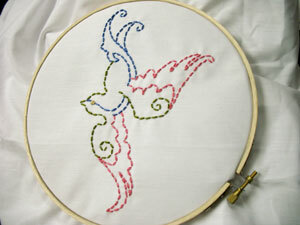 My stitches on this birdy are really far apart; you can make them much closer for a more solid outline. The backstitch is great for outlining when you have a lot to do, but since the stitches tend to be longer than others, it’s not quite as good around tight corners. As you can see, this birdy is pretty much very loose, very basic backstitches the whole way, except when I got real fancy like with his eye, which is a little tiny satin stitch. 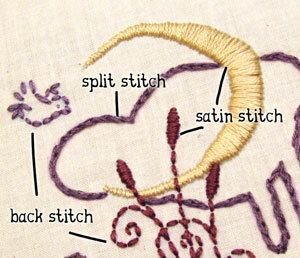 What’s a satin stitch? 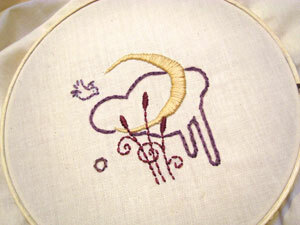 A satin stitch is a nice solid fill stitch you can use to fill in areas. It gets its “satin” name because it leaves a shiny smooth raised surface behind after you’re done stitching. 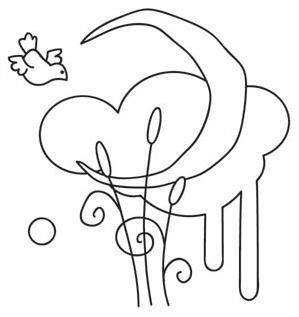 We have a satin stitch for machine embroidery too. To start, be sure you have a knot at the back. Come up at 1, down at 2. Then, don’t come back up right next to where you went down. Instead, once you’ve stitched from top to bottom (1-2), go back to the top again (3) and then go back down for your next stitch (4). The reason we always go in the same direction (top to bottom or bottom to top) is because otherwise it’s difficult to keep those wayward threads straight. If you always came up right next to your last stitch, your needle placement needs to be super exact to keep your stitches straight. 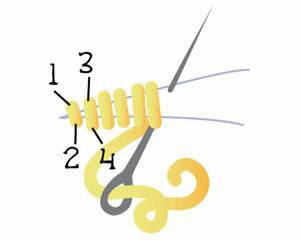 So, start from underneath (1) (with a knot, as usual) and come up and back down one stitch length (2). Now, instead of coming up far away, like in the backstitch, you come right up in the middle of the stitch you just made, splitting the threads, hence, the split stitch (3). Go back down again the same stitch length, (4) and repeat the process! 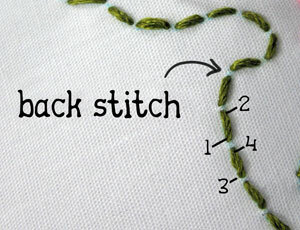 This stitch is also great for outlining, and since the stitches end up a bit smaller, it’s a little more maneuverable. 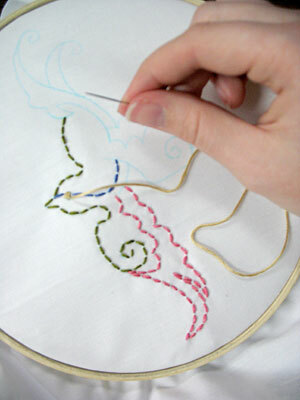 It does, however, take a little longer to stitch, since each stitch is half its usual length. 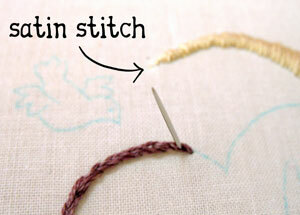 If you’re going to do a bit long outline of something, you may want to try the backstitch instead! Here’s a close-up of a piece done with all three of these stitches thrown in for good variety. It’s fun to mix up stitches to see what kids of effects and textures you can achieve. There are lots of other fancy stitches out there, from stem stitches to chain stitches, but these few basic stitches will get you a long way when you’re just starting out. This stitch is called the French knot, and it takes a little bit of practice to get the hang of, but it can create some really great accents or even some fabulous texture when repeated as a fill. Start, of course, with a knot in the back, and pull your needle through. Once you’ve pulled your thread through, grab a few inches above where it comes out of the fabric, and pull it taut so you can control it better. 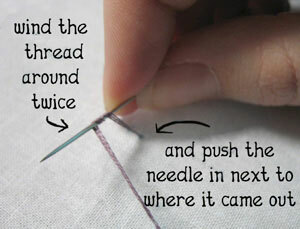 Wind the thread around your needle twice for a nice large knot. Keep tugging gently at the thread to keep it wound around your needle, and re-insert the tip of the needle right next to where it came out. 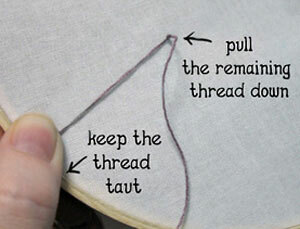 Do NOT place it exactly where it came out, or you might pull your stitch out completely when you pull the thread through. Keep it as close as possible to your marked dot, though, so you get a nice neat stitch. 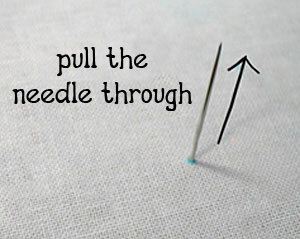 Once the tip of your needle is in the fabric, tug on the thread that’s wound around the needle. 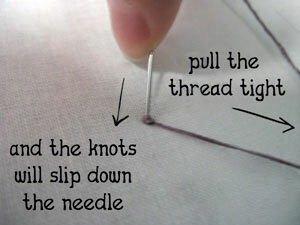 The knots will slip down the needle to form a small little knot at the bottom. Don’t relax the thread yet, keep tugging at it gently so the knots don’t loosen. Now pull your needle all the way through your fabric, but keep the thread holding the knots firmly but gently held as long as possible. You’ll have to let go eventually to let the last of your thread go through your fabric. The more you can control the tension on the thread, the less likely it will be that your knots will loosen as you’re finishing the stitch. Once you’ve pulled your thread all the way though, you’re done!! 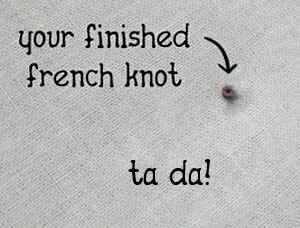 Your little neat French knot is finished. 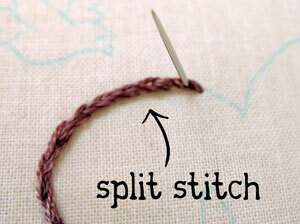 Now you have a few basic stitches to get you started! Nothing’s stopping you now. There are hundreds of designs to choose from, and hundreds of ways of stitching out each one. 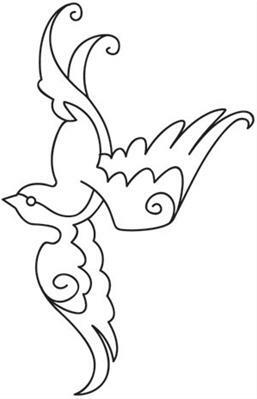 personalize it with your own colors, your own stitches, or even change up the design! Then if you like, share it in our flickr pool or send it our way at support@urbanthreads.com to show off your stitchy work!